This article was originally published at 32nd World Congress of Art History (Melbourne, 2008). In the earlier 1980s, two exhibitions took place at Chinese National Art Gallery in Beijing attracted much attention, one from Picasso and one from Rauschenberg. Picasso may have had greater fame, however, it was the Pop-art star Rauschenberg who had greater influence on Chinese modern later on. This interesting phenomenon can perhaps be explained by the fact that most Chinese artists were trained with realist technique from the art academies until 1990. Pop art, which presented subjects in realist style taken from everyday life, was easier to accept in Chinese society and easier for Chinese artists to adapt in their own modern art experiments. It may not very easy to recognize that Lu Shengzhong and Xu Bing’s connection with Pop art. Lu Shengzhong and Xu Bing’s work was different from most works in the modern art movement which seems to directly copy from Western modern art, and was based on Chinese tradition. Lu Shengzhong took inspiration from Chinese folk art. In a joint exhibition with Xu Bing held at the Chinese National Art Gallery in 1988, he decorated the room with hundreds of hand-made energetic red-coloured figurines based on Chinese paper-cut style of the North-western countryside. The dramatic visual presentation, such as the massive popular red colour and the repetition of folk art pictorial signs, was indebted to Pop art. The work expressed a wild energy of life belonging to Chinese folk art, which had been left out of official art for a long time. Xu Bing’s installation A book from sky (1989) was made up by hundred-meter lengths of texts in traditional Chinese format, which beautifully displayed from the ceiling to the ground. The remarkable thing was that the characters in these elaborately crafted works were, in fact, meaningless, nonsense, and faked scripts, and every single model of the word from the text was painstakingly curved by the artist himself. The work caused immediate controversy, while some viewers were immersed in its classic beauty, others saw it as nihilist towards Chinese traditional culture and modern politics. Whatever was the case, Xu Bing personally paid his tribute to the veteran Social Realist artist Gu Yuan and to the American Pop artist Andy Warhol, as he saw the ‘avant-garde’ spirit from both them. 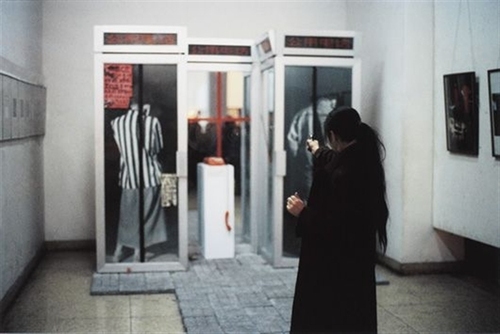 In the Modern Chinese exhibition of 1989, Xiaolu shot her own Pop-style installation at National Art Gallery. According to the artist, the act was caused by her own personal emotional and psychological wounds. However, it also echoed the socio-political atmosphere of 1989. After the Tian’an men square incident 1989, “Political Pop” and “Cynical Realism” emerged as a criticism to the Chinese political situation. Wang Guanyi’s work Great Criticism Series: Coca-Cola, (1993) ironically exposed the conflict between Chinese modern politics and its rising consumer culture. Fang Lijun’s work A Yawn (1992) reflected the cynical and alienated attitude towards Chinese immediate social and political situation. Attitudes towards Chinese artistic and political past were not always as simple as they may have appeared, and many artists looked back with complex emotion. Sui Jianguo’s sculptural Study on the Folding of Clothes series, for example, took its title exactly from the name of a course for students who studied European classic realism in the Central Academy of Fine Arts. In his Study on the Folding of Clothes – Bound Slave (1998), the artist put Michelangelo’s famous heroic icon into a Mao suit. Artistically, the work represents a critical comment on the Chinese academic training in European realist art; politically, the work can be seen as criticizing the fact that individual freedom although promised by the socialist revolution had failed within the Maoist socialist system. 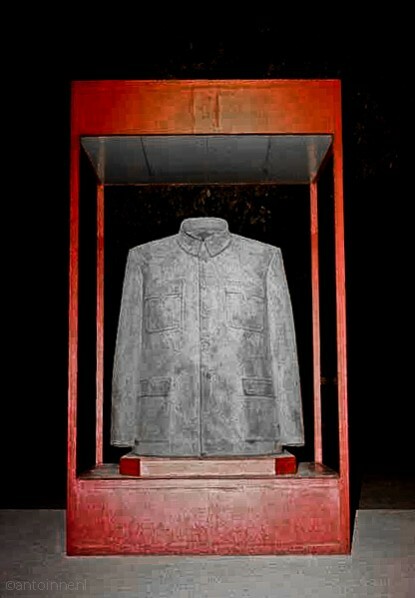 Sui Jianguo’s work Legacy Mantle (1999), directly borrowed from the imagery of the Mao Suit itself. The work could be seen as a strong criticism of Chinese socialist realism. The significant emptiness left within the Mao Suit suggests the loss of social criticism, which is the core of social realism obviously absent in Chinese arts and modern politics dominated by Mao’s ideology. On the other hand, however, this work can also be seen as a tribute to Maoist Socialist Realism. Chinese Socialist Realist art is the result of the modern revolution and fundamentally different from modern art development in the West. It emphasized the socio-political role of art; it required classic realist art skills; it regarded not only the history of European art from the Renaissance as a source of inspiration, but laid claim to popularity by its social responsibility and criticism. As well as the socialist revolution, it embodied the spirit of humanism, scientific rationalism and democracy, which were crucial for the transformation of Chinese culture and for intellectual insight into modern Chinese society. This work, therefore, could also manifest the modern values of China’s previous politics, as the country liberated itself from modern colonialism and feudal rule. A similar approach toward the Chinese revolutionary tradition can be seen in Zhang Xiaogang’s oil painting Chapter of a New Century – Birth of the People’s Republic of China (1992). In the Centre of the painting, the reddish baby was a clearly emblem of the newborn republic as the descendant of Chinese modern revolution; in the background, the historic photos of the revolutionist including Mao in his youth, can be seen as acknowledgement to the country’s revolutionary past. A locked box, underneath the baby, however, may refer to a legacy of the revolution denied by the new government. While the memories related to the revolution faded away in contemporary Chinese society, the artist recorded the significant moments of history to reveal the hidden secrets and real significance of the Chinese revolution. 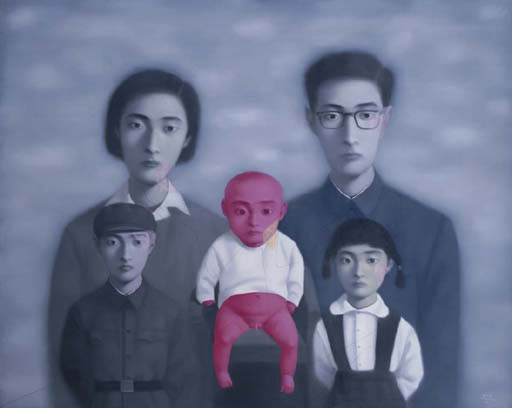 The reddish baby reappeared in one of Zhang Xiaogang’s Family Series (1995), a series of group portraits of a family inspired from real family photos taken during the Cultural Revolution. The disturbing appeal of this painting is that every single person in the picture looks the same without any trace of personality and has a similar mark on his or her face. The look may indicate a cultural hegemony, and the marks refer to a collective memory, which never fades way. While the aloofness and alienation expressed in the picture suggests suffering from oppression, the redness on the baby, however, seems to be a sign of both, the wounds and hope of the revolution, and suggested a rejection of a doomed fate. Based on the technique on Chinese social realism and European Surrealism, Zhang Xiaogang’s work touched a sensitive area of Chinese history between various dichotomies such as reality and illusion, memory and amnesia. Out of the shadow of the revolution, changes in Chinese art in the 1990s brought not only diversity in styles but also more than one starting point. New directions and new possibilities went beyond its core or center. One of the major art tendencies to appear in the 1990s was ‘Neo-Realism’, which best represented by younger generations artist such as Liu Xiaodong. Influenced by Lucian Freud and David Hockney, Liu Xiao dong’s work always deals with social reality in China. His recent work, Hot Bed (accompanied by a video)(2005), for example, exposed the harsh living condition of peasant worker; their sexual anxiety reflected the uncontrolled energy in a society undergoing rapid transformation. As China emerges as a player in the global political and economic arena, Chinese modern visual culture will inevitability integrate with the international art world. To be ‘globalized’ rather than ‘Westernized’, and to be ‘diversified’ rather than ‘standardized’, Chinese modern art will eventually emerge with a new freedom, which, however, can never be separated with its past. If there is anything contemporary Chinese artists may learn from the Social Realism, it goes beyond the style, but the core of the art—Marxist humanism, social responsibility, and the connection with daily life of normal people in Chinese society. Picasso’s exhibition was in May of 1983 and Rauschenberg’s exhibition was in November 1985. The joint exhibition ‘Xu Bing banhua yishuzhan and Lu Shengzhong jianzhi yishuzhan’ held at Chinese National Art Gallery in October 1988. For various reactions to Xu Bing’s work, see Chapter 3, Shao Yiyang,, Chinese Modern Art and the Academy, un publisshed PhD thesis, University of Sydney, 2003. See Xu Bing, ‘Gu Yuan zai wo xinzhong, Meishu yanjiu. 1, 1997 and Xu Bing, ‘Dui Fushuxing huihua de xin tansuo yu zai renshi’, Meishu, October, 1987. Xiao Lu, ‘Guanyu 1989 nian zai zhongguo meishuguan qiangji zuopin duihua de shuoming(xiuding gao)’ , October 2005, at http://arts.tom.com (viewed in October 2005). The terms were first appeared at the exhibition catalogue New art, Post-1989. Hanart TZ Gallery, Hong Kong, 1993. Zhang Xudong, ‘Epilogue: Postmodernism and Postsocialist Society-historicizing the Present’, in Arif Dirlik and Zhang Xudong ed., Postmodernism &China, Durham and London, Duke University Press, 2000 , 432. For this trend, see Yin Jinan, ‘Xinshengdai yu jinjuli’, in Duzi koumen, Jinguan zhongguodangdai zhuliu yishu, Sanlianshudian, Beijing. 1993. 23-29. Shao Yiyang is Associate Professor of Art history and Theory, head of the World Art Studies at Central Academy of Fine Art, Beijing. She received her Ph.D in 2003 in art history and theory from the University of Sydney, and master’s degree at the University of Western Sydney respectively. She is currently the leader of the major research project on visual culture studies committed by the Culture Ministry of China. Her teaching and research focus on Western art History, theory and Chinese modern/contemporary art. She has published widely on contemporary art and theory in Chinese in recent years including a book hou xian dai zhi hou( Art After Postmodern). Her writing on Chinese modern art were presented at the 32nd International Congress of the History of Art, CIHA Melbourne, 2008, and the 29th Art history conference organised by Verband deutscher Kunsthistoriker (Association of German Art Historians)in Regensburg, 2007. “Art Exhibitions Since 1949”，in Pong, David,ed. Encyclopedia of Modern China. vol 4, Charles Scribner’s Sons, Detroit,. 2009.